WHERE is a platform that allows application developers to create location-aware applications that run on mobile devices. Developers can design applications that work on mobile devices without having to write Java, re-write for various handsets, deal with the carriers and all of the other nonsense that goes with mobile product development these days. It’s the toolkit that carriers should be providing to developers. Irish Pubs. Happy St. Patrick’s Day. Zillow. Stand in front of someone’s house and pull up pricing information. Location notes. Leave a note associated with a specific location and see notes other people have left. Twitter. More on that later. These aren’t necessarily the ones I’d use every day, but they are creative uses of location that show off the real power of location-enabled services. Pretty much any application with open APIs can be adapted to run in the WHERE environment within a matter of days. With so many public APIs out there, even a modestly talented developer could create a compelling WHERE application. Flickr. Use the flickr APIs to call up pictures around a location. Let users upload geotagged pictures. Yelp. Search the Yelp database for places near your location. Metro. Live train information for the metro stations closest to you. The other key benefit WHERE provides both to developers and users is an easy-to-use Web site that allows users to configure which widgets appear on their phone and in what order. This kind of desktop/mobile integration will be very important in driving the adoption of wireless services. Right now, WHERE is only available on a few handsets and only on Sprint. At $2.99/month, it’s the closest thing to free. It has a lot of potential to drive adoption of location services by skirting most of the roadblocks the carriers have thrown up, both for consumers and developers. This entry was posted in gps, lbs, local search, mobile, mobile search, where, wireless, wireless data. Bookmark the permalink. 7 Responses to WHERE in the world am I? Providing toolkits to access Location Based Information on a Mobile Device is fine… but it’s still a walled garden and the APIs can only be used inside stand-alone applications that must be purchased/downloaded/installed. For alomst a year now it has been possible to simply add any LBS information you want ( Current GPS included ) to any request being made to any WEB SERVER. This means the LBS “applications” can be server-side, open, and global. 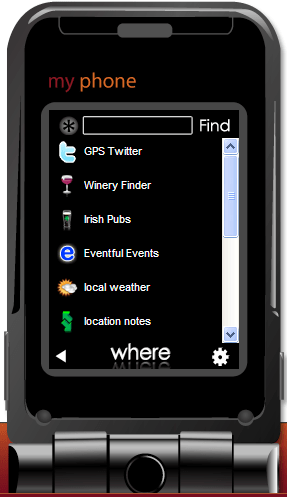 This is the superior way to access/use Location Based Services from a Mobile Device. No “Walled Garden” applications required. US operators block access to the phone’s location information (a few phones with full GPS excluded). You have to get certified to get access which is a long and expensive process. This is probably why most LBS application are subscription based. WHERE is certified. “We are friends with the carriers, so you don’t have to”.